Paraty is a popular holiday spot with Brazilians, yet they have somehow kept it a secret from the rest of us. This tropical paradise overlooks Ilha Grande Bay on Brazil’s Atlantic coast. Paraty put a smile on my face from the first moment I stepped ashore. The vibrantly painted boats that line the coast create a foreground for the well-maintained colonial houses, which fill the nearby streets. Still relatively unspoiled by too much tourism, it is quaint and delightful. 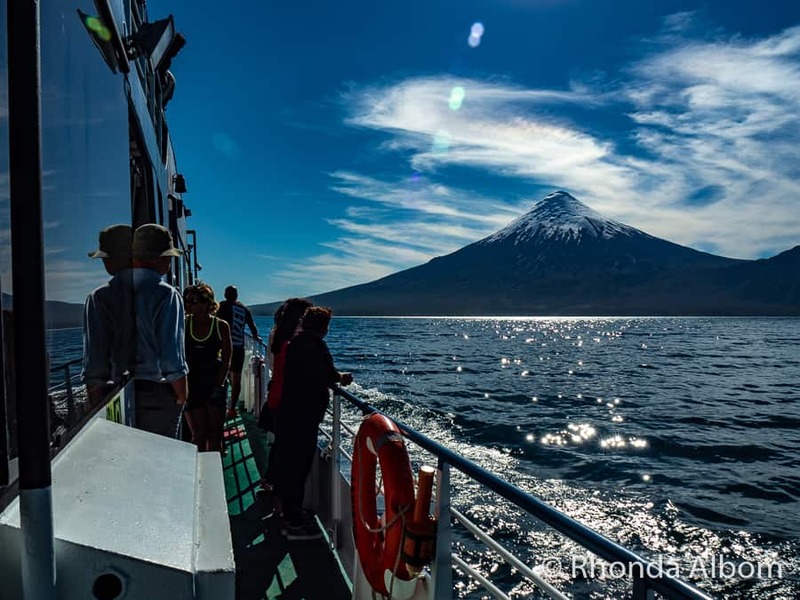 We arrived via a small cruise ship that holds only 700 passengers, yet it was one of the biggest that can visit this port. 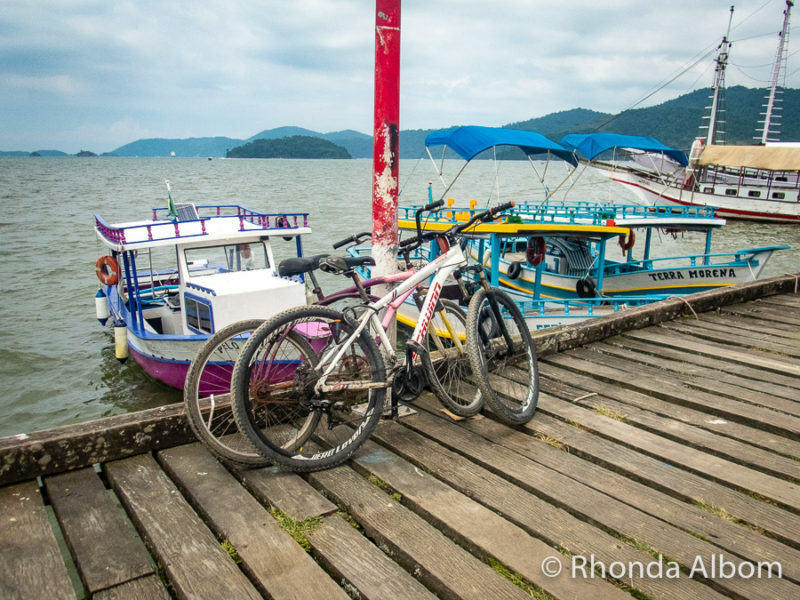 Our ship anchored about three nautical miles from shore and tenders brought us to the end of the Paraty pier. An adventure in its own right, be sure to watch your step as the spacing between many of the planks is larger than one would expect. 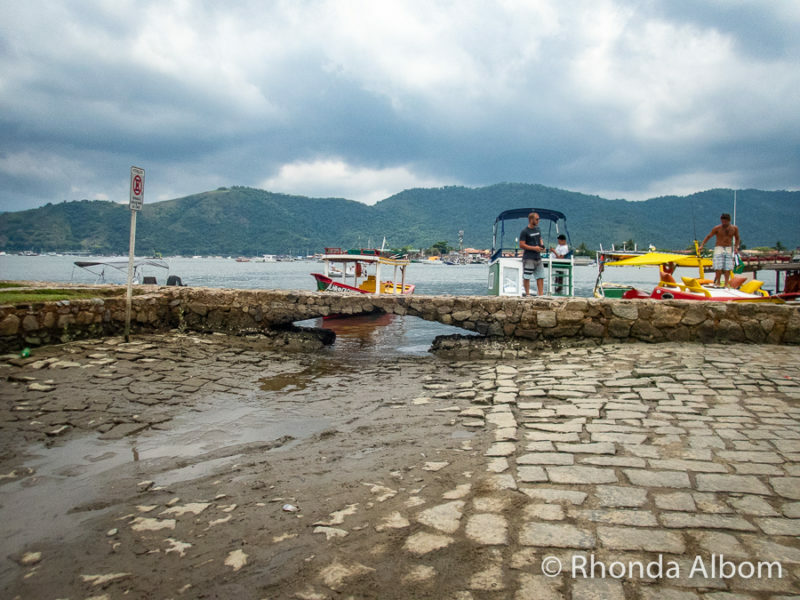 Like stepping back in time, we walked along the cobblestone streets of the old town of Paraty. The colonial buildings were originally built by African Slaves in the 1600s. 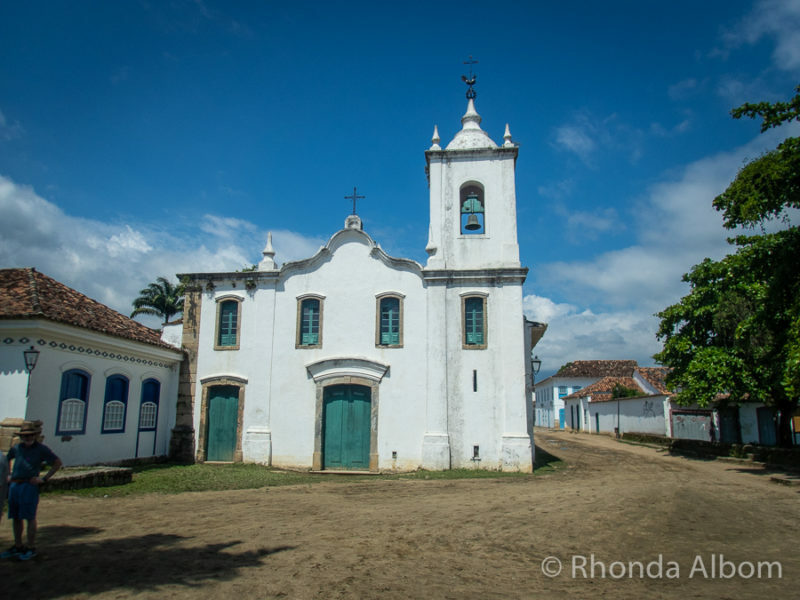 For centuries, Paraty remained relatively untouched and somewhat isolated. Its focus was on fishing, bananas, and sugarcane. In the 1970s Brazil built a road connecting Rio de Janeiro to Santos, the port city for Sao Paulo. Suddenly, Brazilians passed through Paraty, thus instantly creating a local’s paradise. If you are not arriving via cruise ship, that road is the best way to get here. You can take a bus or rent a car. 3 Where is Paraty Brazil? 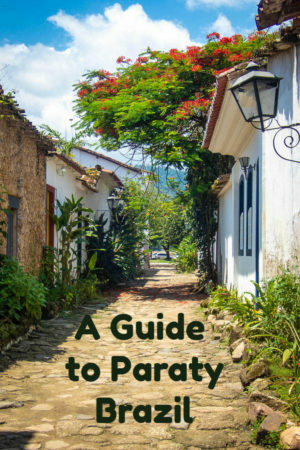 6 Have you been to Paraty Brazil? Is it on your bucket list? 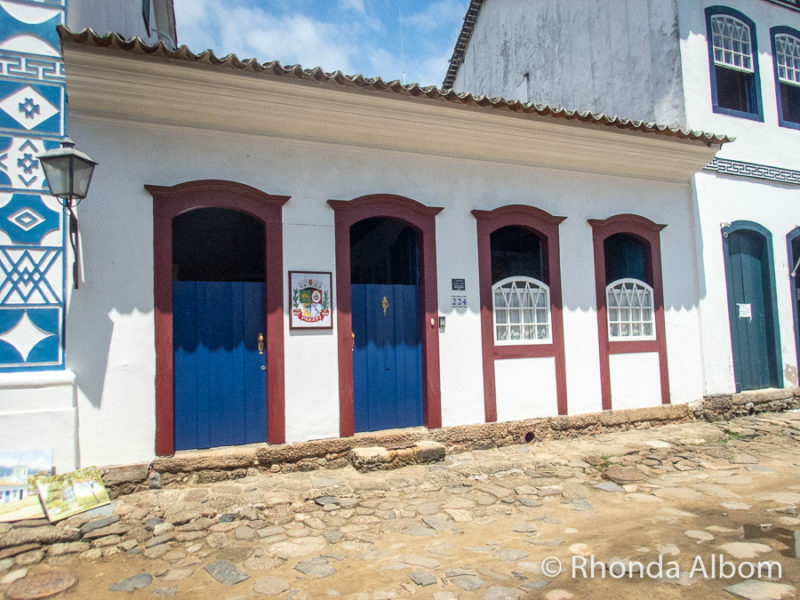 Paraty is ideal as a cruise port, as it’s easy to see the highlights in a day. However, with a desire for some relaxation or a passion for watersports and one could easily spend a week or more here. The maze of cobblestone streets adds to the old world charm of Paraty’s historic district, now a UNESCO World Heritage Site. Recognizing Paraty’s uniqueness, the Brazilian government incorporated restrictions requiring all buildings in the historic region to retain their colonial look and colours. The requirements include new construction, which also must look colonial. One of my favourite streets in Paraty. Interestingly, Paraty is built just below sea level. Every full moon the seawater rises, and the streets flood 6-10 inches deep. As the water retreats back to the sea it creates a natural filtration and cleaning of the streets. This was more important back in the days before the town had a sewage system. Notice the houses are built off the ground for the floods. Also, the larger doors are because people used to let the horses stay in the house. This break in the seawall is one of the places where the water flows into and out of the city streets during the high tides. This was once the home of the Portuguese royal family. 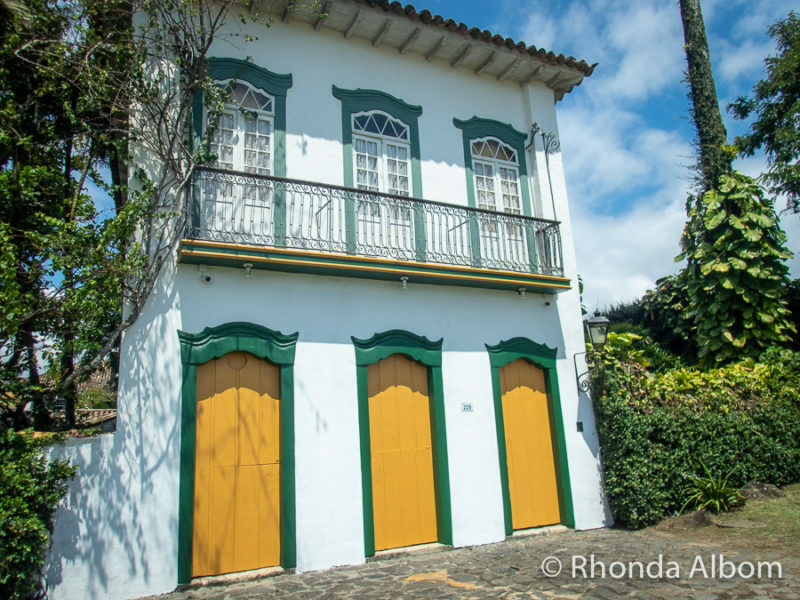 The historic district is an area that you can easily walk through on your own to enjoy the architecture, but taking one of the Paraty tours really brings it all to life. 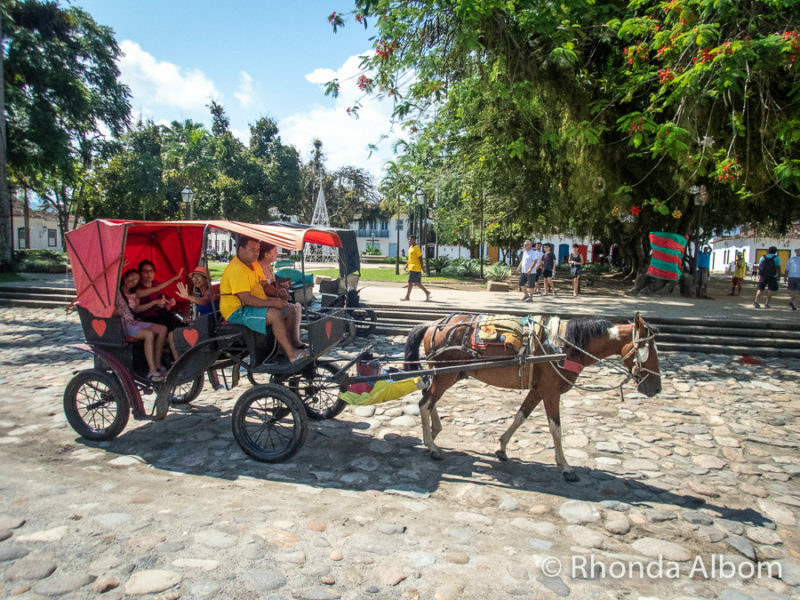 *Note: there is a free walking tour Paraty option. It’s not really free, you tip what you think the tour is worth, and we found it excellent. The historic town centre is pedestrian only. Tourists can take a horse-drawn carriage ride. We opted to avoid this activity as the horses looked a bit lean. Moreover, we imagine that the cobblestone streets would make the ride rather uncomfortable. Horse-drawn carriage at Matriz Square. There are plenty of trendy restaurants and shops in the old town. There are four churches located in the old town, each built for a different group of people. Our Lady of the Remedies is a church for the elite (built from 1646 to 1873). 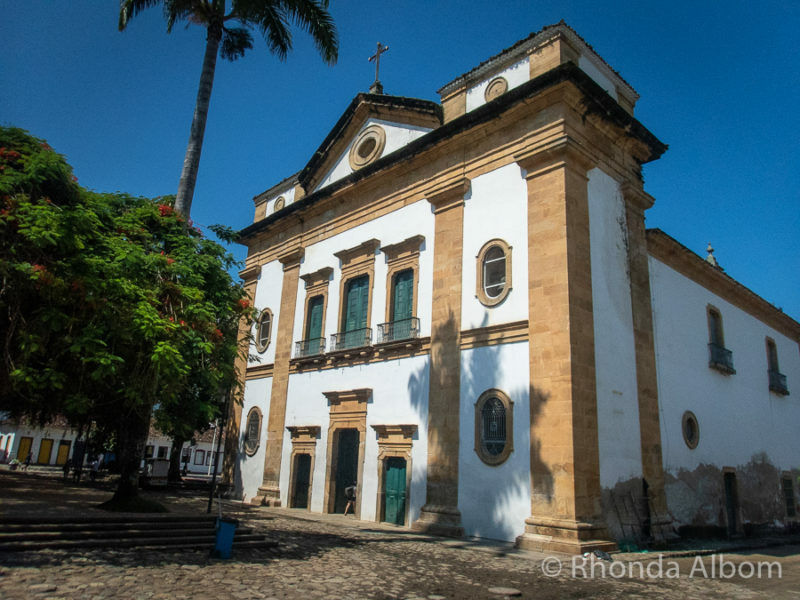 It is the largest church in Paraty. Our Lady of Sorrows church was for women when their men were out to sea (built in the 1800s, and rebuilt in 1901). A soldier would always stand in the window, looking out to sea. If he saw any ships without flags (unknown ships), he would run to one of the forts to get help. The Chapel of Santa Rita was for everyone (built in 1722). It is now the Museum of Sacred Art. The Church of Lady of the Rosary and Saint Benedict is a simpler and more rustic design built by and for the slaves. Surfing, swimming, or just relaxing, visiting a beach is one of the many things to do in Paraty Brazil. There are two main beaches close to the port, but looking out from the port, we could see many secluded beaches along several of the local islands. I would love to have a kayak or small boat and really take time to explore the area. Like every town that attracts tourists, there are plenty of artisan shops in the touristic areas of town. Plus, there are market-type stands near the port. There is a fleet of boats at the port, each offering different daily opportunities, ranging from fishing to relaxing, from water sports to sunbathing. Prices are negotiable, and if you don’t like what one is offering, simply move on. The number one off the beaten path destination, Bocaina National Park is a treasure. 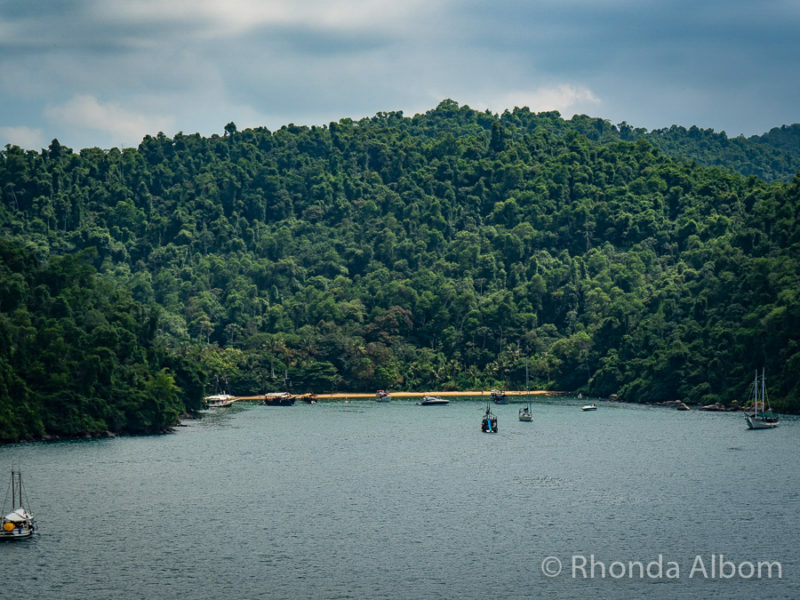 Here you will find dramatic Paraty Waterfalls, hiking, rivers, and streams. We didn’t get here, but several people on our ship spent the day in the national park and raved about it. If you don’t have your own vehicle, the best way to get here is with a tour. This is probably the best place to kayak in Paraty, and another activity we wish we had more time to do. Don’t miss it. Here is a chance to hike on the only tropical fjord on the Brazilian coast. Caminho de Ouro is the road travelled by slaves (first indigenous, then African) who carried the gold from the mines to the port of Paraty. Now it is a hiking trail and adventure. Less than two kilometres from historic downtown, here is an opportunity to enjoy ziplining, swing bridges, and hiking through a Brazilan rain forest. Paraty is in an area of Brazil known as the Costa Verde (translated to Green Coast). It is between Rio de Janeiro and Santos. 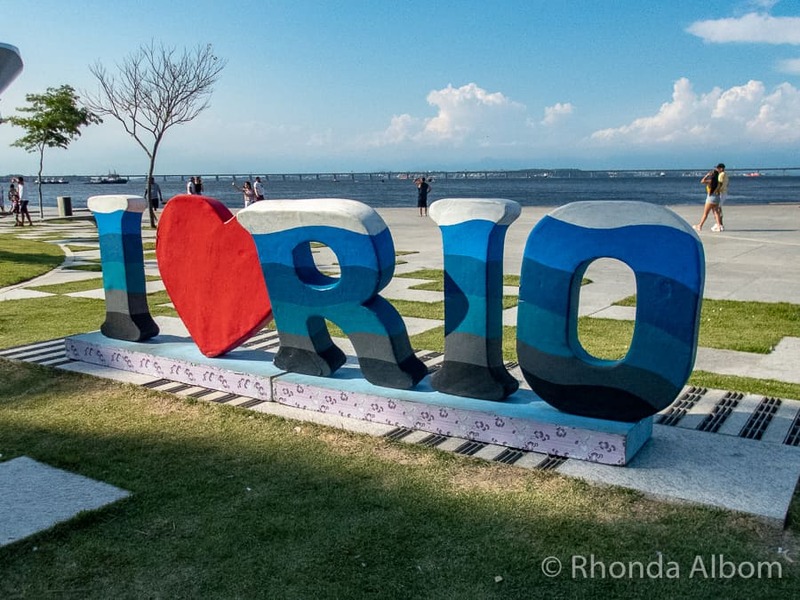 Drive time from Rio to Paraty is 3 hours 45 minutes, while it takes four hours to drive from Paraty to Sao Paulo. A collection of boutique hotels and backpackers, there are Paraty accommodation options for every budget. Locals pronounce the town’s name as Par a chē. The currency is Brazilian Reals, although some shops will take small denomination US dollars. While major credit cards are widely accepted, there is often a discount available if paying in cash. The best place to get cash is from Banco de Brazil. From a safety perspective, it is best to get it from inside the bank, rather than ATMs on the streets. Try Cachaça – a locally made alcohol. We have heard it is popular in Paraty with cinnamon or with coconut. However, we have only had it with lime and sugar, or with mango (my favourite). Taxis are not metered. You will want to negotiate a price in advance, and the advice is to write down the price and have the driver sign it. Take note, the dock and the cobblestone streets are uneven pavement. I think it would be an extremely difficult area to navigate with mobility issues. It is customary to tip 10% in restaurants. Remember to look first to see if it was added automatically to your bill. The “Okay sign” made with the loop between your thumb and forefinger is considered an obscene gesture. Paraty is one of several coastal Brazilian cities we visited including Rio de Janeiro, Santos (coastal city for São Paulo, Buzios, and Itajai. 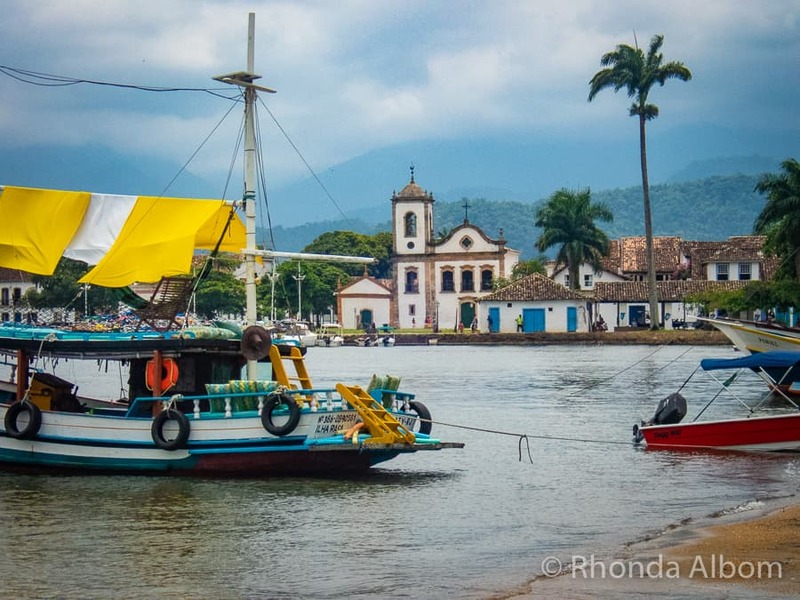 Have you been to Paraty Brazil? Is it on your bucket list? 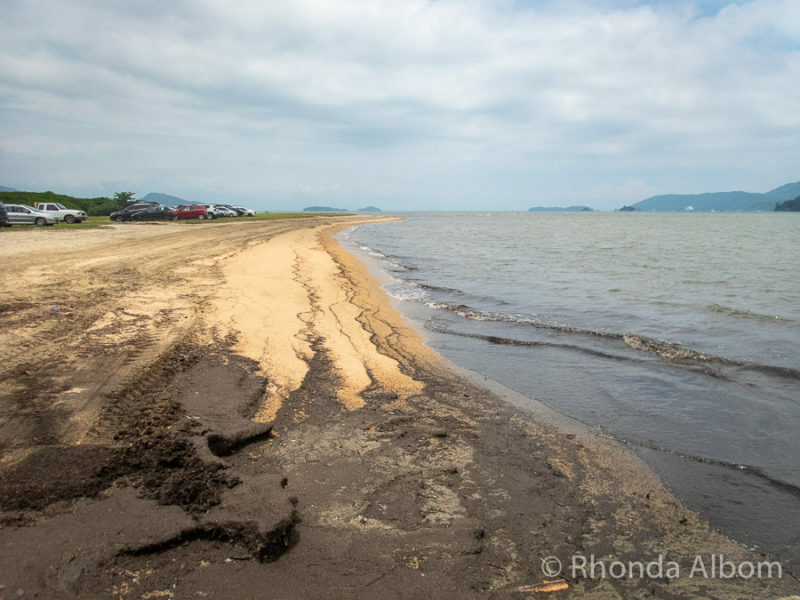 We have heard of Paraty, but only knew it was on the Brazilian coast. Glad to learn a little more about it! The town certainly seems like a gem, and we would love to have some time to hike and kayak in the area. And, of course, enjoy some Cachaça! We like it with lime and sugar, a Caipirinha, but mango sounds like a great option! Thanks for giving us a glimpse at this beauty! 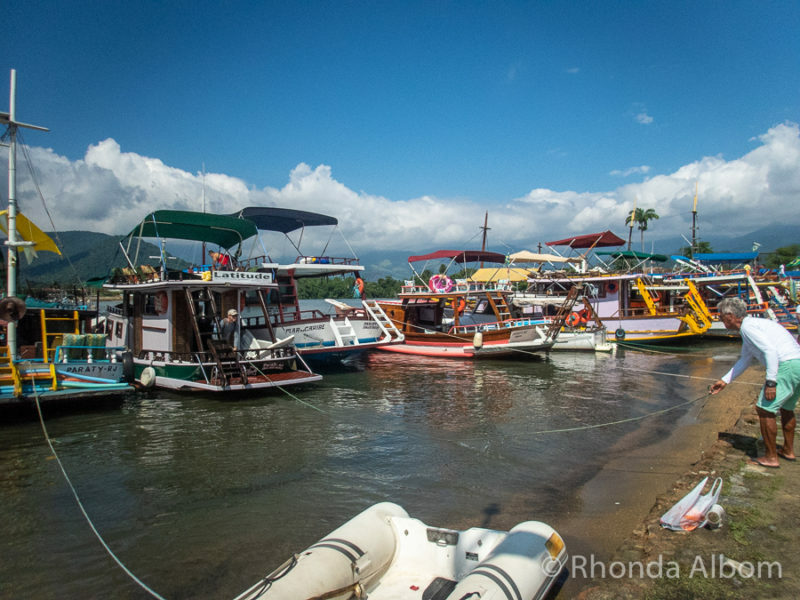 Paraty looks like a fun but unexplored place to visit – love your photos of the town and especially the boats. Thanks for taking me somewhere new that I’ve not heard of. Parity looks like a great place to explore. I love the idea that the streets flood every full moon. I can’t decide whether it would be fun to be there during a full moon or just a whole lot of hassle. 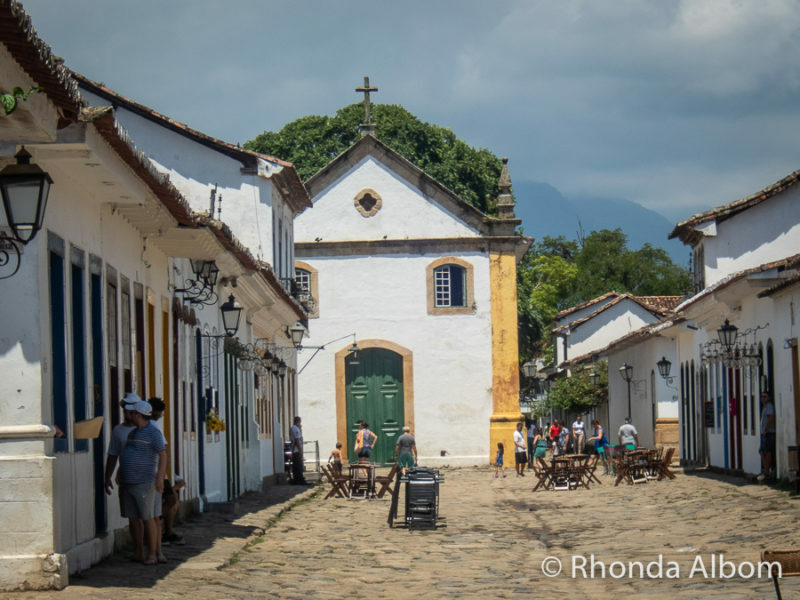 What fun to discover a fascinating and untouristy place like Paraty! It’s interesting that the water comes in each day and then recedes. Reminds me of the main square in Venice, when you wade through the water. 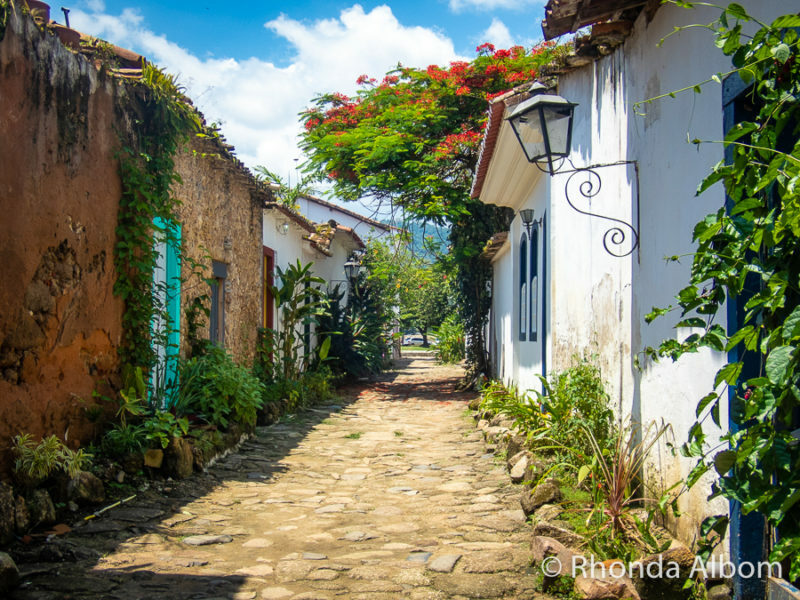 The cobblestone streets and buildings in Paraty are so appealing. I love that the horses used to go into the houses! What a cute little town. Paraty reminds me a lot about Colonia del Sacramento, a small town in Uruguay which we visited on a day trip when we stayed in Buenos Aires. The same small churches, colorful houses and narrow, poorly paved streets. I love this kind of towns where you can get lost for a day and discover cute little things on every turn. We also went to Colonia del Sacramento, and yes there are quite a few similarities, but they are also quite different. Paraty is more colourful with all the vivid boats around, plus it is more developed as much of the construction is new, built to look old. 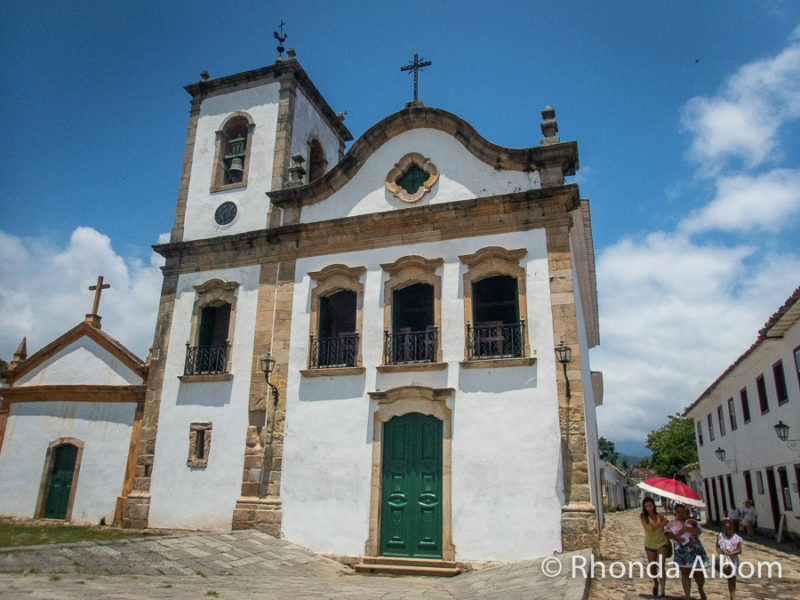 Plus the old town in Paraty is larger, with more churches. Great comparison though. This seems like such a beautiful place! Long may it remain secret and unspoiled by hoards of tourists. Beautiful. Very true, although there are plenty of Brazilian tourists there. This beautiful but historical place was interesting in my eyes. Rhonda have shown us very interesting educational locations. I was looking at a cruise in the New Zealand location. Everything looks good except the total price between the cruise and flight. Maybe some day we can do it but for now, the Caribbean cruise is about all that I can afford. See ya my friend. One of the cool things about cruising is they sometimes take you to places you might never have discovered. As for flights, you can set up flight alerts with tools like the Skyscanner App and they will let you know when there are deals. A beautiful and unique spot. Thanks for sharing this spot with us. I love finding little treasures like this with so many unique features, like the planned flooding. What a beautiful and quaint place. I love small towns by the sea. The town is very cute. I wish I had more time to see the beaches there. I could definitely spend a week there! It looks beautiful! Thank you for sharing your experience there! Yes, I could spend a week there too. One day was not enough. Yes, the churches were one of the highlights. Sounds like a fun place to explore. I can see why they would want to keep it secret though. I’d love to be on one of those boats. I’ve got boating in the blood. Yes, I can see why they don’t want it overrun with tourists, and I can image you on one of those boats. What a beautiful coastal town to visit! I love how vibrant everything is. Sign me up! Yes, it was the vibrancy that first caught my eyes. Especially the colourful boats. Hmmm, I wonder if they did get the ideas from the Romans. Good thought. I really hope to go to Brazil one day! Great post – I love the historical sites, and walking tours are great for them. Budget friendly and so informative. I was recently in Athens and we also used walking tours to discover the city. I really hope to get back to Brazil someday soon. I loved it. It looks very inviting. Interesting they let the streets flood once a month. At least they are prepared for it. Can you imagine a horse in your house? LOL – there is no way I would have a horse in my house. Great photos of a place I’d never heard of. Perhaps some day I will explore the area. Honestly, I had never heard of it either, before I saw it on the cruise itinerary. The fact that it was built below sea level is so neat Rhonda. Clever, although even though I knew few swim in the sea anyway, I figure it would be a poor idea considering run off. What a nice little tropical paradise. Good point, although its not really used for sewage these days (let’s hope not anyway), but it does keep the streets clean, and leaves little crabs all over the place. Great place to be.Rustic but beautiful buildings. Going to Brazil is a dream of mine. You captured the beautiful so well with your photography. I also hope to get into the interior someday and explore the amazon. There are several lovely spots in Brazil, all along the coast there. We went from Buzios to Itajai. Love your pictures and your information on Paraty! It’s a beautiful place, making photo taking easier. Looks like you had a fabulous time on the trip. I loved the photos of the historical area, it looks like a great place to learn about the history and culture. Yes, the historical district was fascinating, especially with a guide to give us some of the interesting backgrounds.